👇Here is one more map on who controls what in Libya by the end of March, 2019. The situation in and around Tripoli was fluid through the weekend with at least 25 killed and 80 wounded, according to the country’s health ministry. U.S. military personnel have evacuated, as have some 2,800 civilians, according to the United Nations. “We are coming, Tripoli, we are coming,” he said. On the brink — again? Observers fear that the confrontation will escalate into a full-scale civil war in the nation, which is still reeling from the NATO-backed intervention. Haftar’s announcement of an advance on Tripoli came as the UN Secretary-General Antonio Guterres was wrapping up a peace-brokering mission in the country, in which he met with Haftar as well as the UN-backed prime minister, Fayez al-Serraj. “I leave Libya with a heavy heart and deeply concerned. I still hope it is possible to avoid a bloody confrontation in and around Tripoli,” Guterres lamented. The developments also come ahead of UN-brokered peace talks slated for April 14-16. On Friday, the UN Security Council held an emergency meeting on the situation. The UN-backed government shows no signs of holding out for the peace talks. Prime Minister al-Sarraj reportedly ordered his military to be prepared for combat and gave the green light for airstrikes in a bid to “defend the civilian population and crucial facilities,” Tass reports. 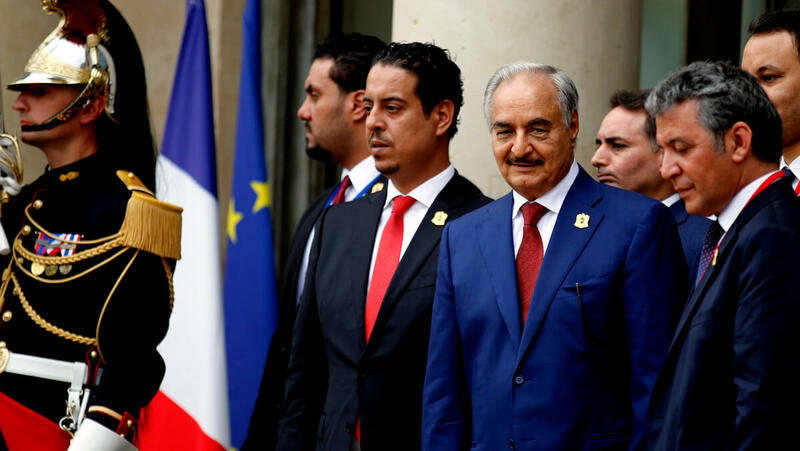 Haftar recently told an Arabic-language newspaper that “Libyans will have a single cabinet this month,” RT reported, noting that should Haftar take power, he would control the largest oil reserves in Africa, although he already controls many oil fields. Haftar’s ambition to rule is decades old. He was among a group of officers responsible for the coup that installed Gadaffi in 1969. After being taken prisoner by Chad in 1987 while working for Gaddafi, Haftar turned his back on the leader. After his release, which was secured with U.S. assistance, Haftar joined the National Front for the Salvation of Libya, an opposition group supported by the CIA, to prepare an army that could overthrow Gaddafi. According to officials cited in a 1991 New York Times report, Haftar’s men were “trained” by “American intelligence officials in sabotage and other guerilla skills.”. He was eventually flown to Langley, Virginia — where the CIA is headquartered — and lived there for two decades, working with the CIA to topple the Libyan leader from abroad. He and 350 fighters loyal to him were admitted into the U.S. and given refugee status. In 1996, Haftar went back to Libya and again attempted to depose the leader. But by the time Gaddafi was ousted in 2011, Haftar had fallen into obscurity. Then, in 2014, as the local al-Qaeda affiliate Ansar al-Sharia was occupying Benghazi, Libya’s second largest city, Haftar announced his return on Libyan television. He then launched Operation Dignity, which ousted the Islamists from Benghazi. In 2016. Haftar launched Operation Swift Thunder, which took control of key positions in the “oil crescent” from the UN-backed government. The following year, Haftar banned women under the age of 60 from traveling alone in areas under his control. But it was U.S. involvement in the Middle East and North Africa that led to the wholesale destruction of Iraq and Syria, and produced figures like the CIA-trained Hafter in the first place. U.S. involvement in Libya, in particular, led to black Africans being sold as slaves in open-air markets and to the refugee crisis inflaming the ultra-right in Europe. The sins of the USA are out in the open now. Hopefully more people will wake up with the information and insight you are providing here. The CIA have proven yet again that the spelling of their name should have the letter “I” removed for their logic in foreign affairs that causes more strife than what had existed . Have you considered that that is, in fact, the objective? More weaponry required = more money for the usual suspects.